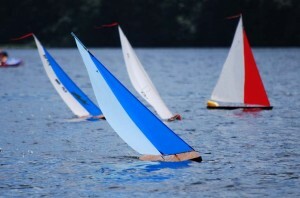 Here's a quick look at each of our RC sailboats. Many sailors end up building several of our boats but let us help you pick which one might be the best to start with! All of our models are fast and fun but each one has its own special characteristics. Feel free to call us anytime if you have questions--1-800-206-0006! Dimensions: -Length: 27 inches -Height: 43 inches Basic Information: -Despite being the smallest RC boat, the T27 holds its own quite well in open water and sails on lakes and ponds very nicely. -Its ideal wind speed is 5 to 12 mph, but the T27 will be fine in wind speeds of 15 mph or higher. 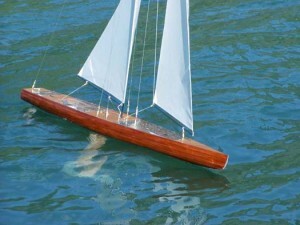 -The deck of the T27 RC Sailboat is entirely sealed and the boat is completely self-righting so it can never capsize. -The keel requires just 8 inches of water, which is not as deep as our larger boats, so the T27 can be easily launched in shallow water. -The mast and sail slide right out of the hull when you unhook the shrouds and forestay so the T27 can be stored in very little room. Is This The Boat For You? 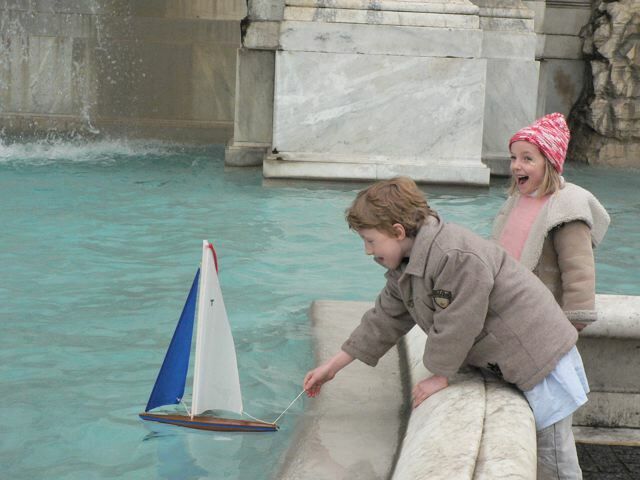 If you enjoy traveling, going on vacation, camping or cruising, and you would like to bring your Tippecanoe model sailboat along, then this small, easy-to-pack rc model sailboat would be a good choice for you. Basic Information: -The T37 is big enough to sail excellently in large bodies of water and will handle well in winds as strong as 18 mph and waves that are getting quite built up. -The T37 is still easy to transport. The hull with radio control gear and batteries installed weighs only 5 pounds. 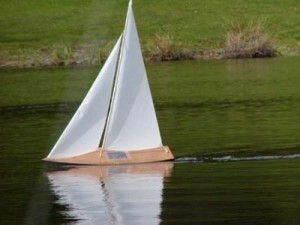 -The mast comes out in less than a minute, so the boat is quite convenient to store. -The keel depth is 12 inches, which is not extreme and makes launching from the shore relatively easy. -The T37 sails incredibly well. Being larger, the T37 is faster than the T27 and can handle strong winds more easily. Is This The Boat For You? 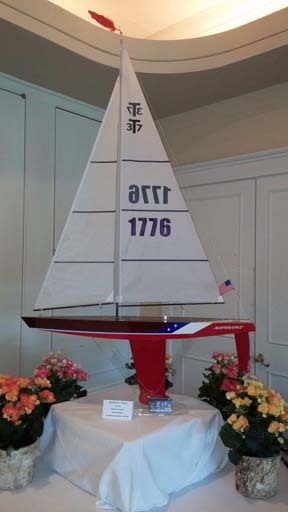 There is no finer RC sailboat than the T37 or a more beautiful yacht for racing or pleasure sailing. If you’re interested in sailing in more open water and rougher conditions the larger T37 will have more power to handle bigger waves and stronger winds. The T37 is simply faster than the T27 because of its 10 extra inches of waterline (longer hull). There are over 3,000 T37s sailing around the world and many racing groups are established all over the US. If you are interested in racing or sailing even more competitively, the T37 Racing Upgrade Racing Sloop may be the boat for you. The T37 Racing Upgrade Racing Sloop has the same dimensions and building process as the T37 Racing Sloop, and it includes a number of additional enhancements for greater sailing performance, like an adjustable boom vang, double-throw sheeting system, and a stronger sail servo. (Call us if you have any questions about T37 sailors possibly in your area to sail or race with, 1-800-206-0006). 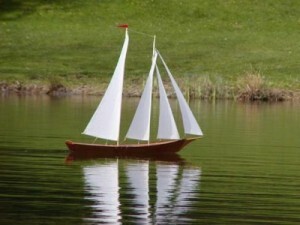 Basic Information: -The schooner is a classic design with a nearly full keel and a bowsprit. With two masts, the T47 flies a traditional schooner rig with a mainsail, foresail, stay sail and jib. -With the classic nearly-full keel on the schooner, tacking is not quite as snappy as on the T37 but she still tacks very nicely and jibes quite handily. -As with full size schooners, the T47's upwind performance cannot rival the speed of modern sloop rig sail designs like the T37, but the T47's off-the-wind performance is superb with her large sail area and the low center-of-effort in her gaff rigged schooner sail-plan. -For stronger winds, the schooner rig is ideally suited to reducing sail and remaining balanced. 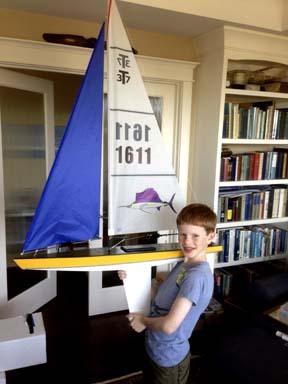 The T47 kit comes with an extra foremast which, when switched in, replaces the middle two sails. The schooner sails beautifully in strong winds with just the mainsail in the back and the forward jib. It takes only a minute or two to switch to the reduced sail pattern. Is This The Boat For You? The T47 Fairharbor RC Schooner is a spectacular boat for capturing the traditional feel of sailing ships from the past and always receives admiring attention from passersby. The T47's sailing performance is excellent for a traditional rig with her nearly full keel. If you’re looking for a traditional sailing ship instead of a racer, then this would be the boat for you. Basic Information: -The T50 Racing Sloop is an ultra light design built for exciting and very fast sailing. -The T50's keel is 20 inches deep. A dock is the easiest place to launch a T50 from, or else wear shorts and wading shoes if launching from shore. 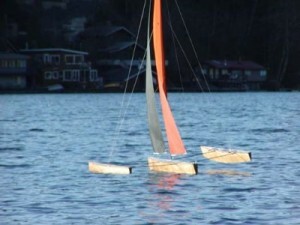 -Despite her size the T50 Racing Sloop weighs only 8 pounds and is still very easy to carry. - The T50 is very carefully engineered to be a phenomenal sailing machine. It is an extremely light and very powerful boat that sails incredibly fast. -The T50 has a wooden strip-planked cedar hull, but with the provided strongback template the whole hull can be assembled and glued together in 5 - 7 hours. The result is a gorgeous display-worthy western red cedar racing machine. -The T50's shrouds can be unhooked, and the mast slides out of the hull in less than a minute for easy carrying. -The keel and rudder also slide out in less than a minute, and you are ready to slip the beautiful wooden hull into your car. Is This The Boat For You? If you enjoy racing with open class RC groups or simply love seeing the boat you built speeding around your lake, this is the boat for you. In racing, chances are that with the T50 you’ll be ahead of the pack. And, racing by yourself, you will frequently be surprised that the T50 can move as quickly as she does. What makes it even better is that the T50 is still very light and easy to disassemble to take wherever you go. Because of its gorgeous wooden hull, the T50 is also a beautiful display for your home. Just remember that it is nearly 8 feet tall! Basic Information: -The T50 RC Tri is quite a different type of boat from our other designs. Sailing a trimaran is like nothing else. -The T50 Tri is ultra light, weighing only 4 pounds for its height of 92 inches (when sailing with the tallest light-air rig). She is super fast. -On a reach the Tri will out-sail everything. Multihulls excel at speed on courses from slightly above a beam reach to a broad reach. The T50 Tri will lift a hull in almost no wind and speed off across the lake. In stronger winds she can lift both the windward hull and the center hull to fly off on one hull and the tip of her keel. -Tacking is always more difficult with a multihull than a monohull. With light multihulls like the T50 Tri, if there is much chop, you will find it easier to jibe than to tack. In smoother water the T50 Tri has no problem with tacking. -The recommended wind range for the T50 Tri is 5 to 16 miles per hour. The T50 RC Tri comes with a light-air main and jib as well as a heavy-air rig, so there is a wide range of sail combinations for different wind speeds. The taller, light-air rig has an 80 inch mast. -Trimarans, unlike monohulls, do not have a weighted keel and so more depends on the sailing skill of the skipper since it is possible for trimarans to capsize. However, we have tested the T50 Tri in eighteen mph of wind with the heavy air rig and could not flip it. -The three hulls of the T50 RC Trimaran come apart in about three minutes and the mast unsteps in less than a minute so the boat, despite being very large when fully assembled, can still be easily transported. Is This The Boat For You? For overall performance and maneuverability combined with exceptional speed the T50MOD is the best choice. But for straight out speed on a reach, and for the exhilaration of sailing a multihull, you can't beat the T50 Tri. So, if you like speed and are looking for a sailing challenge, the T50 Trimaran would be a good choice. 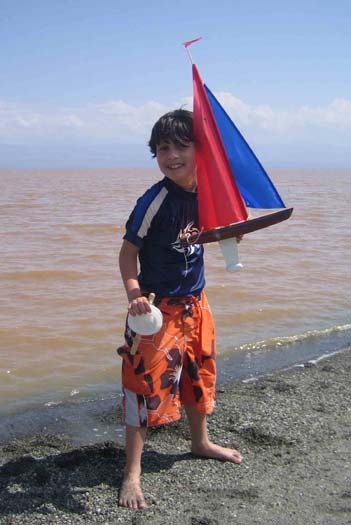 Call us at 1-800-206-0006 or email us at fun@modelsailboat.com to order or if you have any questions!